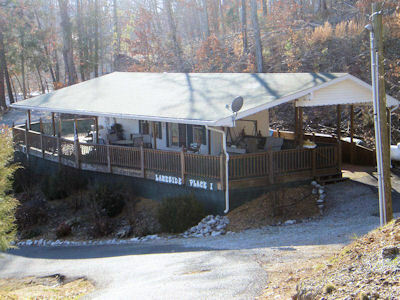 This unit is only steps from the lake and dock and has 1,000 square foot of wonderfully furnished covered deck. For a couple: private get-a-way with deluxe queen bedroom and sunrises from the deck! For a family: 4 bunk beds for the kids, and what a play area that deck makes! Lakeside Place II has 2 Bedrooms--one queen and the other a double bedroom. Features fresh towels daily with the kitchen and dining area fully stocked with dishes, cookware, coffeepot, toaster and microwave. Both have cable TV/VCR, AC/Heat, gas grill on furnished lakefront deck and complimentary dock space. Photos below are clickable. Note: The Lakeside Places are Non-Smoking Units. Sorry No Pets allowed in these units.